The track was opened in 1962, by Les Griebling. In 1981, Mid-Ohio was purchased by Jim Trueman, a renowned road racer and the founder of Red Roof Inns. Trueman put a lot of money into the facility, building the garage area and 3 spectator mounds. In 1982, CART added the Mid-Ohio track to their yearly circuit. The American Le Mans Series and Grand-Am series also compete at the track. 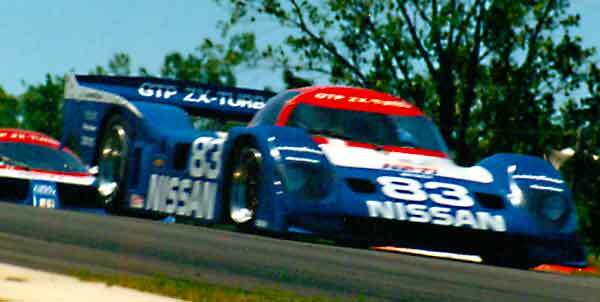 The Sports Car Club of America hosts regional events at Mid-Ohio, and from 1994 through 2005, held its national championships, the "Runoffs", at the track. Mid-Ohio also hosts annual vintage automobile and motorcycle race weekends during the summer. The track opened as a 15-turn, 2.4 mile (3.86 km) road circuit run clockwise. The back portion of the track allows speeds approaching 180 mph. A separate starting line is located on the backstretch to allow for safer rolling starts. The regular start/finish line is located on the pit straight. In 1990, the track underwent a refurbishment. A new retaining wall was built, the entire track was resurfaced, widened, and concrete was paved in the apexes of the turns to prevent asphalt deterioration. In addition, a straightaway was paved through the chicane, allowing for two different track layouts, the original 2.4 mile circuit, and a new 13-turn, 2.25 mile (3.62 km) circuit. In 1990, the CART series began utilizing the 2.25 mile layout. In 2006, a second major refurbishment saw several improvements. The entire circuit was repaved, and the concrete patches in the turn apexes were removed. A new motorcycle "short course" was created by connecting turn one with the backstrech, and another motorcross oval was created by connecting the chicane straight with the backstrech. The additional layouts allow simultaneous use of the multiple course, for instructional and competitive uses. The improvements also include a new motorcross facility to be opened in the future. There is grandstand seating for 10,000 spectators, and 3 observation mounds alongside the track raise the capacity to over 75,000. The Mid-Ohio School offers several high-performance driving schools along with several defensive driving courses, and competition courses for racers looking to gain a competitive edge. Founded in 1993 to give motorists of all levels expert driving instruction at one of North America’s premier permanent road courses, help people of all ages and experience levels - from teenagers to licensed racing professionals - become better drivers. The Mid-Ohio School expanded into offering motorcycle instruction in the spring of 2006. Two Motorcycle Safety Foundation courses, and Performance Track Riding are the classes offered at The Mid-Ohio School. Mid-Ohio Sports Car Course opens its gates at 7:00 a.m. each day. All spectators must be off the premises by 7:00 p.m. Sunday evening. Please note that the North Gate is an advance ticket entrance only. To purchase tickets at the track, please use the main gate entrance located off Steam Corners Road. Personal golf carts (those not rented from Golf Car & Equipment) require a $100 vehicle pass, purchased separate for each event, that must be displayed at all times. All golf carts must be operated by a licensed driver. No golf carts can be driven on spectator mounds. No spectator bicycles permitted anywhere on Mid-Ohio property. No spectator personal "off road" vehicles, dirt bikes, ATVs, mopeds, minibikes, scooters, etc., are permitted on Mid-Ohio property. Scaffolding is prohibited. All platforms must be permanently mounted on truck beds, not more than six feet high, and incapable of being elevated. Please do not block the view of other spectators. To preserve Mid-Ohio's family atmosphere, profanity and drunkenness will not be tolerated. If you are bothered by your neighbor at the camping area or by another spectator, please report them to Guest Services personnel. Guest Services is located at the Gate #3 entrance. No pets of any kind are permitted at Mid-Ohio Sports Car Course. Motorized vehicles are not allowed on the spectator amphitheater mounds. Climbing and sitting in trees, or using trash barrels as viewing platforms, are not permitted. No tents may be tied down to spectator fences. No tents, canopies or dining flies may be erected on amphitheater viewing mounds. Sitting and standing on gates is not permitted. All spectator, pedestrian and mound areas are not permitted to be reserved by roping off or covering with tarps overnight unless authorized by Mid-Ohio Sports Car Course. Any tarps, etc., left overnight will be collected by Mid-Ohio staff. These items can be picked up at Guest Services located at Gate #3. Mid Ohio Sports Course also offers 19 different driving courses for both auto and motorcycle enthusiasts. You can learn high-performance driving & riding techniques.